Tuesday’s friendly match between England and France was originally fixed for charity reasons, to raise funds against the breast cancer. When I bought the ticket weeks ago, I was really happy to contribute for such a noble cause. What happened last Friday night in Paris changed, of course, everything. Surprisingly, the French Football Federation decided to keep the fixture as schedule, to play and remember the 129 people whom lost their lives due to the brutal terrorist attacks. 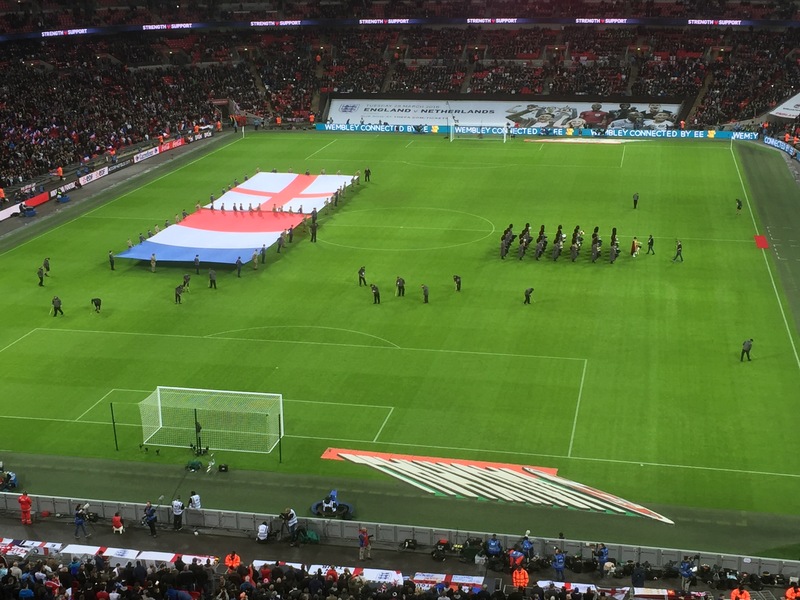 A lot has been written about the emotional atmosphere at Wembley; in this post I will just tell you my experience at the most special game I’ve ever witnessed in my life. Living 500 meters near Wembley Stadium gives you uneconomical benefits, like the possibility of getting home 10 minutes after game’s ending. It’s not all about benefits: for example, on match day, only Tube lines regularly works, or it’s harder to find lots of goodies in the supermarket. 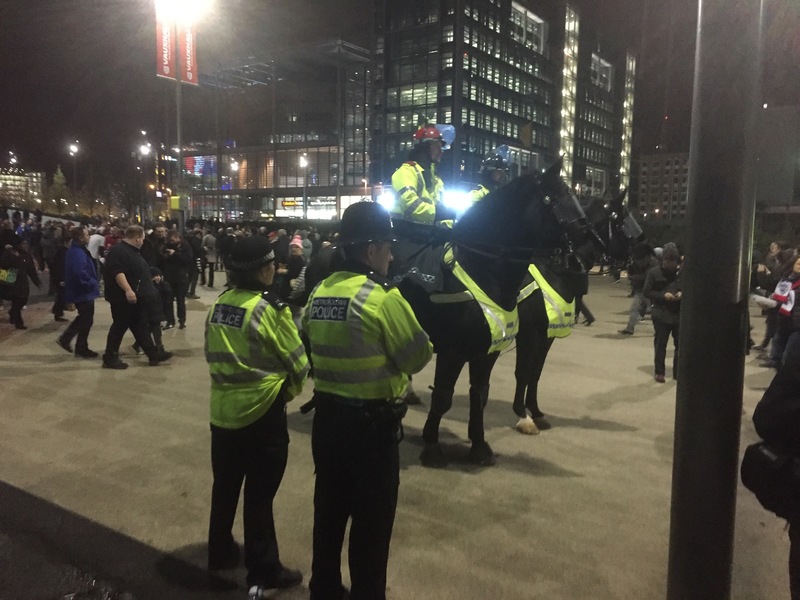 On Tuesday night, the extended number of policemen, fully armed with rifles and bulletproof vests, probably made Wembley Stadium and its neighbourhood the safest places in the whole world. Besides the massive security presence, Olympic Way (the pedestrian that takes you to the Stadium from Wembley Park Tube Station) was a triumph of essentially three colours: blue, white, red. Lots of English fans were chilling and slow proceeding to Stadium Gates taking selfies with French fans, sharing scarfs and smiling all the time. It felt like being invited to a weird party, where everyone is happily enjoying their time but still having the odd feeling that in any moment everything could just vanish. At this moment the news about a cancelled match in Hannover, Germany, for security reasons, began to spread through everyone’s smartphones or tablets. I was amazed about almost anybody wasn’t showing any signs of fear or preoccupation. It was like everybody felt to be safe. I got to my Gate entrance quite early, to avoid spending too much time in security checking. I worried needlessly: in less than 10 minutes since the Gate opening I was already sitting on my seat. Although I spent really a few time at the security checks, I could noticed the effect of the safety reinforcement measures simply by noticing the stadium filling, much slower than usual. After seeing some rehearsal, as usual, by the music Royal band, it was time for the teams to take the pitch for a quick warm up. Crowd’s reaction to France entrance was a perfect anticipation of what Wembley’s climax was going to be in a few minutes. The most framed player in stadium big screens was, by far, Lassana Diarra. His familiar tragedy of losing a cousin in Bataclan’s theatre was known by all the fans, whom constantly applauded him anytime his face appeared on screen or his name was called by the speaker. 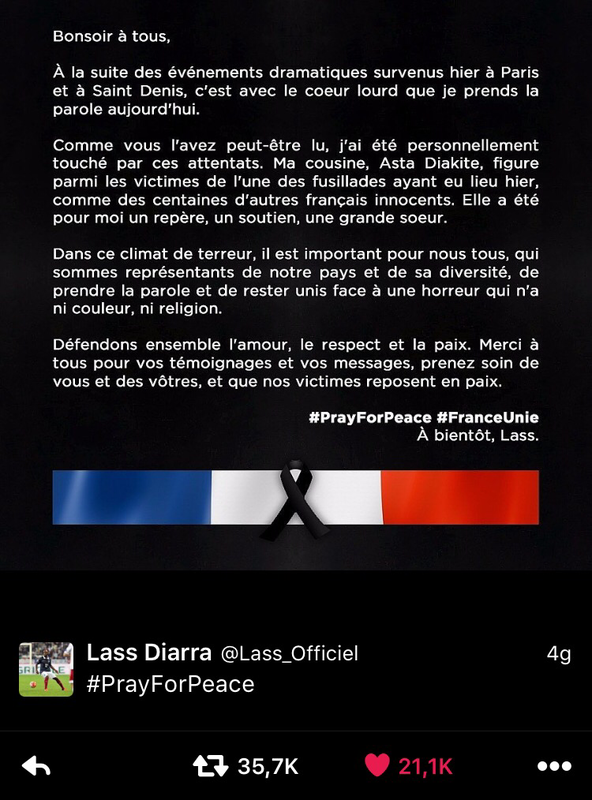 Diarra is also responsible for what I consider one of the best reactions to the Paris Attacks. The details of pregame ceremony weren’t precisely clear to the audience. We all knew that we were supposed to sing, all together, La Marsellaise, with the lyrics that would had been displayed on stadium screen. A few minutes before kickoff the teams entered the field, with a 70,000 people standing ovation that went on for quite some time. Teams were followed by a delegation led by Prince William, Roy Hodgson and Didier Deschamps; each one of them was carrying a flower crown, which stood in front of the benches during the whole match. Behind them, there was a group led by British PM David Cameron. After the floreal homage, it was time for a much anticipated moment: the National Anthems. I hope that the videos can help understand what it felt being there. I’ve had the luck, in my life, to witness a few real special Sport Moments. Surely these Anthems can be placed in my all-time Top 3. After a long and emotional standing ovation, it was time to close the remembrance with a minute of pure and absolute silence. 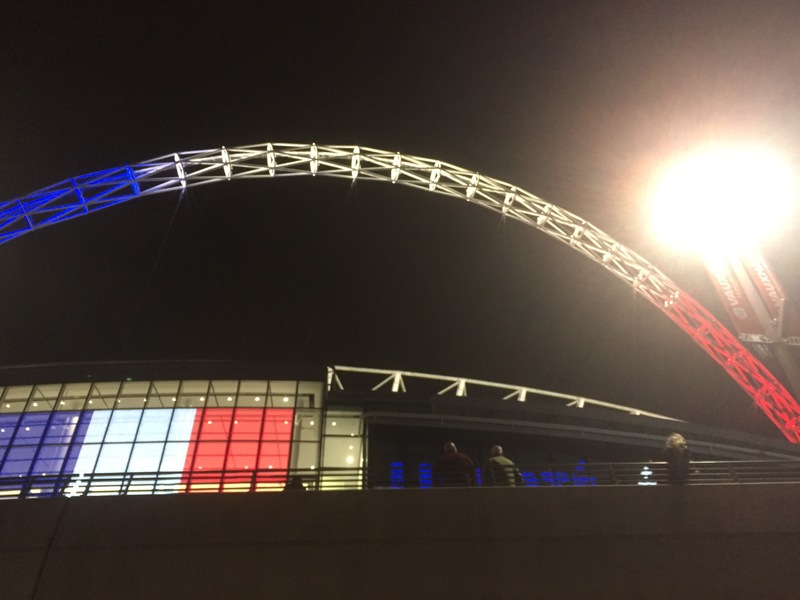 The sound of Wembley’s silence was the loudest possible answer to what happened four days before in Paris. After these emotional moment, it was time for some football. England’s beautiful goals scored by Dele Alli and Wayne Rooney gave something to celebrate to English fans, but last Tuesday was really more than just Football. I’m not naif and I don’t think that Football has redeemed its hurted image with Wembley’s events. That is something that goes beyond a simple emotional moment during a special occasion. But Tuesday’s match and pregame atmosphere shows that in complex times, ones in where people feels the need to gather all together and focus their minds into something ‘light’, all we need is Sport. Sport’s ability to form groups and to develop strong feelings (in good or bad ways) it’s something that represent the true nature of Sport itself, and perhaps the main reason why We Love Sport. I don’t have the competencies to talk about what happened in Paris. All my prayers and thoughts are, of course, with the French people and, between all, with my friends and persons I know whom are in Paris at the moment. I consider myself as a calm and moderate person. I try to don’t be dominated by fear and unrationalism. I’ve been sitting and watching at BBC News for over a hour now. All I see is the news floating continuously, with lots of phone reporting. All the reported titles are about confirmed information and first handed sources. No one is speculating over unconfirmed news and unreliable sources. That is what makes a news agency a trustworthy one. I’m writing this words on my phone after looking over and over again at my Twitter timeline. And all I’ve saw is exactly the opposite of what I’m watching on BBC. At this moment Twitter is filled of fears and unconfirmed sources, which have more power than a Tsunami. I’m not naif or stupid, I know that what happened is probably caused by Islamic terrorists. But we don’t know anything at this moment. Anything. And based on the live reports from Paris, time will pass before knowing anything certain and detailed. The only people who takes advantage by this floating fear are the terrorists themselves. I’m no one to tell people to not hate Muslims or to not blame Isis for what is happening. I would simply ask people: DON’T FREAK OUT. This is the most disrispectful thing imaginable. Don’t be dominated or driven by fear or hate. No one wins in getting more retweets or likes. No one wins in delivering unconfirmed sources. And that would be terrorist bigger win.